Today saw people take to the streets (or snow) on seven different continents today, for the first March For Science, an event that’s been brewing ever since the Women’s March brought people together in support of women’s rights back in January. Intentionally set for Earth Day, the event was meant to serve as a reaffirmation of the importance of science to humanity’s continued existence on the planet, especially in the face of phenomena like climate change, and the political leaders who may or may not believe it exists. The March(es) were held in more than 600 cities today, from Washington D.C. to London, and all the way down to a supportive mini-march at a research station in Antarctica. 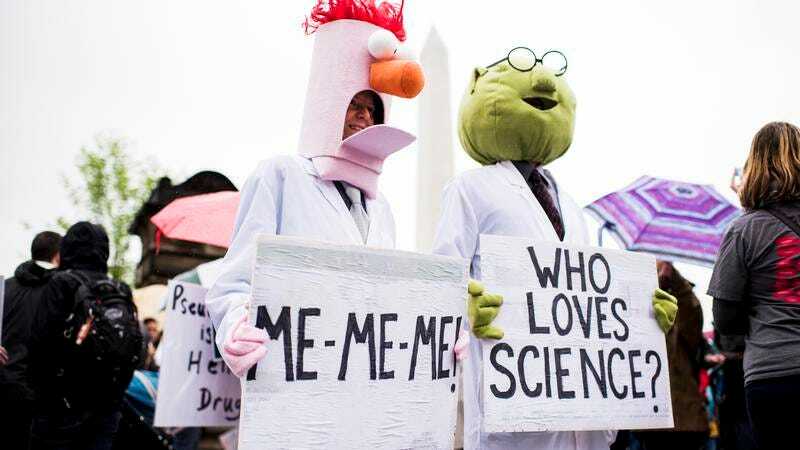 Unsurprisingly, science-friendly celebrities came out in droves—virtually, or even via flesh and blood—to support the event; Bill Nye, Questlove, and current Doctor Who star Peter Capaldi were all seen in attendance, while Twitter has filled up with voices of support. Speaking of Trump, a number of protesters called him, and his administration’s pushes to deregulate factors that lead to climate change, as part of the problem today’s march was meant to address. During his speech in Washington, Questlove flipped a quiet bird at the White House, while Nye gave an interview this morning stressing what a “dangerous” place the world has become now that science is being treated as partisan.